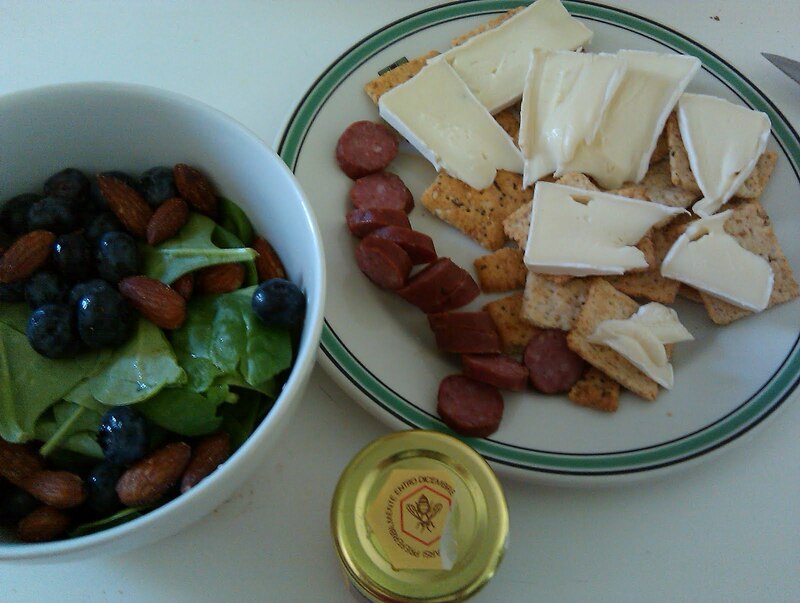 Soup up my lunch: Brie, summer sausage, crackers, spinach salad…and dark honey? Today I didn’t want anything elaborate so I threw some of my favorite things together. We discovered an actual freestanding butcher shop and had such a positive experience shopping there that we are now exclusively getting our meat from a butcher. When we were there, they offered us a sample of summer sausage. My husband and I find it to be quite addicting on crackers (especially Trader Joe’s “everything” crackers – my favorite cracker). Brie happens to be my favorite cheese. Everything was sure to be delicious until I decided that honey needed to join this meal. I thought maybe it would be nice to drizzle some on my salad. The honey is dark and tastes differently than other honeys. I don’t know if that’s a characteristic of Italian honey in general or if the bees who made this honey were eating a special diet. It was one of the readers who told me that honey doesn’t go bad so I decided to open up the little jar. My husband is a “saver” and will save gifts of clothes and food to hold onto their “specialness” as long as possible. That personality trait has rubbed off on me somewhat too. But I finally just decided that this honey needed to be eaten. I’ve been eating it on bread and it’s a little strong, but still pleasant. Putting a little honey on my salad was a bad idea. The salad was sweet enough with the berries and the deep, musky honey didn’t fit in. Ever tried honey in an unusual way? Any tips for me on my lunch? I hate Lunchables, but this lunch looks like an improved Lunchable-equivalent…not very creative, but filling in a hodge-podge way. OK, I have been known very occasionally to drizzle honey on bacon. So not healthy but oh so delicious. I like the lunch. I get the lunchables similarity, but every now and then it is good to change things up. Besides this has a very picnic-y, al fresco kind of feel to it. Honey is such a lovely food. I love it with yogurt and walnuts of course. But it is also very good with figs or on a peanut butter sandwich. I use it in many dishes and dressings like my coleslaw dressing when you need a little sweet but you don't want to wait for sugar to dissolve. Apples are also delicious dipped in honey. Or you should have tried the honey on the crackers and brie! In regards to the saving things because they are special comment. I encourage you to use these foods or treats!! Yes, Honey's shelf life can be measured in centuries sometimes but not everything is that way. I believe that life is about our experience, what good is a jar of honey on a shelf to us when compared to the memory of eating it with loved ones? My mother was very much this way, looking at special unopened bottles of perfume or wine made her happy. But she passed away at age 50 over ten years ago. After she died I was cleaning out her bathroom medicine cabinet and I came across a packet of bath salts that she had received as a gift from an expensive store several years earlier. She was so thrilled about getting the present and coveted the store, that she kept the salts and never used them. When I found them it made me so sad to think that she missed out on using this lovely gift that was intended for her. I used the bath salts that night, and I have tried to value experience over posessions ever since. We never know what life will hold tomorrow, enjoy sweet simple things. Because as we build our lives and families we come to realize that there are more birthdays and gifts and Christmases next year with still more new and exciting gifts to come our way. toast a good whole grain bread, spread with goat cheese, slices of strawberries, and a drizzle of honey – it is fabulous! I eat honey and peanut butter on toast or regular untoasted bread….so yummy! Honey is good as a dressing on salad if you treat it as you would sugar in dressing. Sugar is in every dressing you buy (well, those with fake sugars or HFCS aside). It is used as an emulsifier to make the oil and vinegar "mix" when you shake it. Mustard actually does the same thing. Making your own dressing is extremely easy. Now that I've been doing it for a while, I wonder why they sell dressing at all! It's another one of those "convenience" things that really just makes us forget how to do something without adding much convenience to our lives. So just take equal parts vinegar and oil (I tend to go easy on the oil though or just add some dijon mustard instead) and put in a pinch of sugar or a few drops of honey (this would be for a single serving or two). Voila! Homemade dressing. You can make a larger batch for several servings if you want – don't worry too much about being precise in the measurements. If the dressing won't stay mixed even when you shake it or if it takes too vinegar-y, add a little more sugar. Remember, you can always put more in, but you can't take it out! Btw, I LOVE brie and sausages with crackers too! Yum! Thanks for your comments! I love cheese and crackers. Even though Brie is my favorite, cheddar is a close second. Thank you for your advice Table of Promise. I am always saving things for a 'special occasion' and never use them. Today is the day! I agree with Faith on the goat, strawberry, honey combo. This morning I had warm brown rice – a frozen version you just steam in the microwave for a bit – blackberries and a drizzle of honey for breakfast. It is DELICIOUS drizzled over greek yogurt as it gets semi-firm against the cold yogurt like a candy. Yum! I pulled out the toddler divided plates (w/lids) and began using them for homemade "lunchables" for my kids school lunches. We'll all happily eat cheese and crackers! Add that summer sausage, some fruit…. I think the honey w/ brie might be great too. It might have been better on the salad if you'd balanced it with a good vinegar. Instead of Italian gourmet honey, try local honey. It has health benefits beyond simply being "not sugar". As a child I would sometimes sneak a spoonful of honey. My parents probably knew and just didn't say anything. Now I eat honey on my yogurt. I love brie, but really sharp cheddar is my favorite cheese. I recently bought some raw cheddar and raw pepper jack from the farmers market. YUM! I love spinach, but it is really hard to get most of the nutrients unless the leaves are pulverized or cooked. I've been putting spinach in my smoothies (banana + peach or apple + 1 cup water + 1 -2 cups raw spinach) Tastes like a fruit smoothie and I'm getting a lot more leafy veg in my diet. I trade off with kale and other green leafies. I've been having this for lunch several times a week this Summer. Very refreshing. Out in Tasmania, there is this awesome little honey shop that has every kind of honey imaginable, including some with with hot peppers and cajun seasoning. It's GREAT as a salad topper (though, one more savory than sweet). When I saw honey as one of your lunch ingredients, I thought the honey would very good drizzled over the brie and crackers-the salty/sweet flavors would be a nice compliment to each other. I love this lunch! My family is Italian, so antipasto platters are very common for family gatherings, lunches, parties, etc. Your lunch was like the French version of an antipasto. My favorite Italian version is cured salami and fresh mozzarella from our local Italian market, kalamata olives, marinated roasted peppers, grape tomatoes and fresh Italian bread. I like to drip the bread in the pepper marinade. A little honey drizzled on a piece of blue cheese = mmmmm. Honey and chopped walnuts mixed into cream cheese then schmeared on a cinnamon raisin bagel = Heaven. Vanilla ice cream sweetened with honey instead of sugar = perfection. I wouldn't change anything about your lunch, Mrs. Q. It looks and sounds perfect to me! Honey works really well on very strong and blue cheeses, as I discovered on a trip to Valencia recently where our shared starter platter of cheese, cold meats and bread was served with a tiny jug of dark honey. It was -divine- over the Gorgonzola and salami! honey and cheese is a classic. I studied food in Italy, and actually went to a lecture by an Italian beekeeper while I was there! Honey in Italy is incredibly varied. Different regions grow different plants, which in turn makes different varieties of honey. It can range from pale pale yellow with a mild flavor or deep and dark like the one you found. 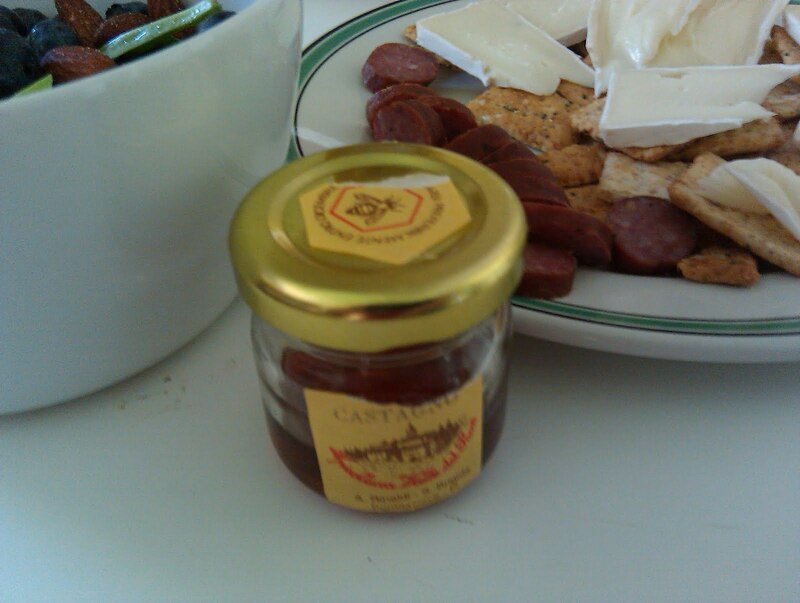 Castagne (on the label of your honey) means it is Chestnut honey. It's one of my favorites, but many people won't like its strong flavor. It may actually have been better when eaten with the brie! Lunch looks great! I would have added mustard to the honey. I love honey mustard dressing on spinach. I also would have added pecans to the salad – something about pecans, berries, and spinach just sings to me. LOVE it. This is something I would have sent with my son for lunch to school. He doesn't like bread or eat sandwiches, and he can't have a lot of processed foods anyway because he can't have artificial food colors, petroleum based lard substitutes (BHA, BHT, TBHQ) or MSG. that looks like a fantastic lunch!! maybe try the honey on the brie? I think a lovely take on Lunchables is slices of baguette, brie, sliced tomato, sliced avocado, and some salt sprinkled on top! You could even put a leaf of basil on it instead of avocado. This is one of my all time favorite snacks! Try whisking or shaking the honey with some oil and vinegar. Or add it to your regular vinegrette dressing. Makes a yummy dressing for salads and marinade for grilled chicken. All I can think about is the amount of fat in that lunch. Between the sausage, almonds and brie, I think it might be a bit of overkill. You want some healthy fats but it needs to be balanced. Skipping the almonds in the salad and maybe adding some other vegetables would have made it a healthier choice. Slice a baguette long-ways, toast in oven until mostly crispy, then spread with Brie, top with finely chopped jalapenos, a good drizzle of honey, and some toasted almonds. Broil that sucker until the honey bubbles and the brie is melted. Take out, sprinkle with chopped red onions, then cut into appetizer-sized pieces. OR, alternatively, eat it all yourself in a gluttonous frenzy. Not that I've ever done that. Looks like a perfect lunch to me. I probably would have drizzled a little honey over the brie and crackers. As was posted earlier, I LOVE honey drizzled over bacon or sausage. And, of course, there's the classic toast with peanut butter and bananas and a drizzle of honey. I've often used honey (or molasses) as a sweetener in place of sugar. Molasses has the added benefit of being rich in iron … and has been prescribed to be taken daily (at least a tablespoon) to boost iron levels. I know this is horrible… but I have been known to eat cold leftover steak with honey. My family cringes when they see this… but lovingly bite their tongues! I adore summer sausage! I eat mine with honey mustard and cheddar cheese on wheat crackers. Agree with Carol – I'd have put the honey on the brie, rather than the salad. Looks lovely, though! I saw a request for a recipe! Get a nice chunk of Chevrè goat cheese, the around 4" in diameter one's ideal. Slice it up into roughly half inch pieces, place on slices of toast that you can if you wish cut into shape with a cookie cutter to match the cheese. Drizzle a little honey on top, and put in the oven under the grill until golden brown. Almond flakes on the cheese before the honey is one variation. Serve this yumminess up on a bed of green salad, with pecans, "craisins" and a drizzle of olive oil and sticky balsamic glaze. Brie is delicious but loaded with saturated fat, so when I eat it, it's usually the only major fat source in the meal. I like it best on crackers or sliced baguette with strawberries on the side. Mmm! I love the rind too. I have known people who discard the rind. Terrible! With summer sausage I prefer a more robust cheese, like cheddar. Maybe I should hunt down a butcher shop. I guess I've assumed their meat would be of no better quality than the grocery store. I'm with those who suggested drizzling the honey over the brie. It's hard to tell the quantities involved but I might have halved all of the protein sources. Of course, maybe you were especially hungry or had been doing or were about to do some vigorous physical activities, in which case, the extra protein might make it easier to get through the afternoon.